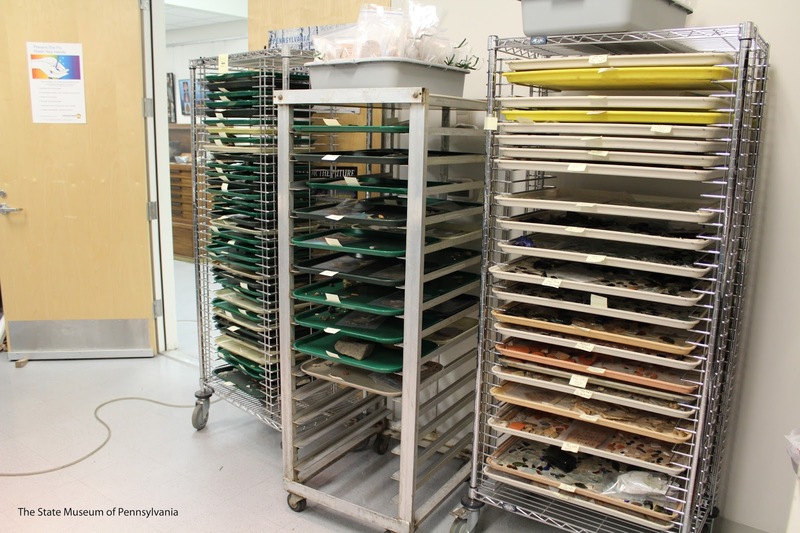 This Week In Pennsylvania Archaeology: Behind the Scenes at The State Museum—Processing the Fort Hunter Collection What happens after the field work is done? 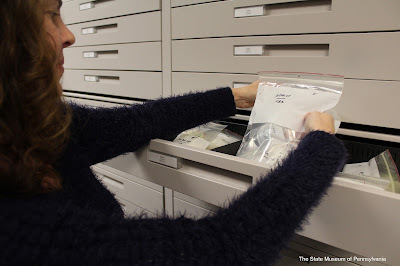 Behind the Scenes at The State Museum—Processing the Fort Hunter Collection What happens after the field work is done? Our last blog about Fort Hunter highlighted the ongoing archival research staff archaeologists’ conduct to inform how we interpret the results of each year’s excavation which aids in directing our plans for future investigations. Over the next few postings we are going to continue to discuss what happens with Fort Hunter artifacts and excavation documents between field seasons. 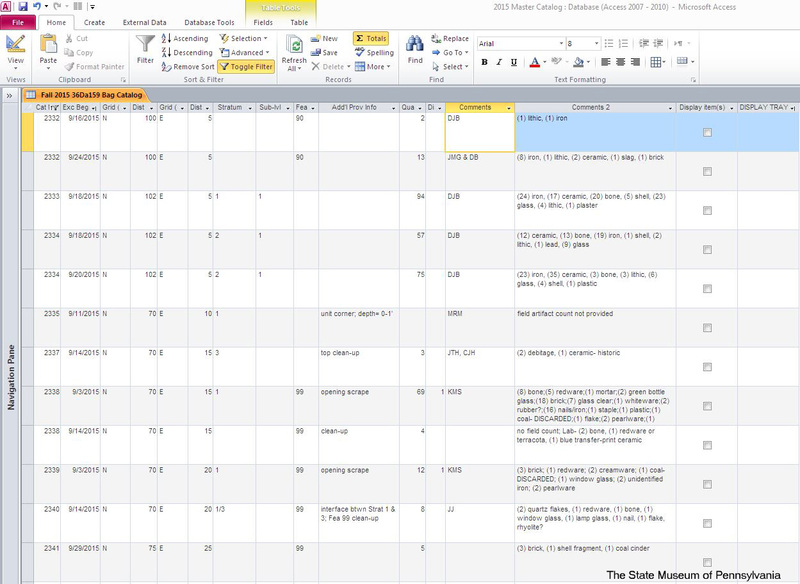 For every day of investigation at a well-defined archaeological site, roughly seven days are required to fully process and conserve the artifacts and archive the associated field documentation. This is a general rule of thumb that many professional archaeologist use to estimate time in preparing budgets for archaeological investigations. The laboratory time needed varies to a degree depending on quantities and types of artifacts, the extent of field records, and the numbers of people working with the collection, but on average the ratio of 1:7—length of field season to laboratory processing time—holds true. The 2015 Fort Hunter field season was conducted for a span of 25 days, with over 12,000 artifacts recovered, 133 proveniences documented (excavation unit levels dug and subsurface features identified, etc. ), and 470 digital photographs taken. Based on the ratio of 1:7, the estimated time for a single person to fully process the collection would be around 175 days or about seven months working five days a week. This estimate projects an April completion date of the following year to fully inventory, curate and archive collected artifacts and documents for any given fall season. 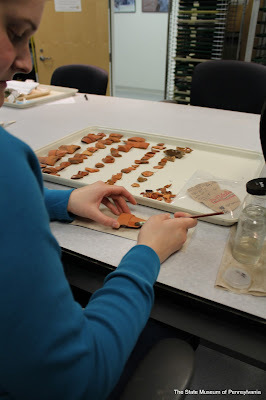 Luckily we have two staff members in the archaeology lab and a rotation of several dedicated volunteers who greatly assist with the cleaning and labeling of artifacts. Working together we are able to generally complete the lab processing of Fort Hunter annual collections by early January, while juggling other projects and responsibilities. As with any collection that is processed in the lab, the initial steps are to organize and record the provenience information from field bags through the preparation of a digital inventory; and stabilize the artifacts through washing, dry brushing or other conservation techniques as needed. 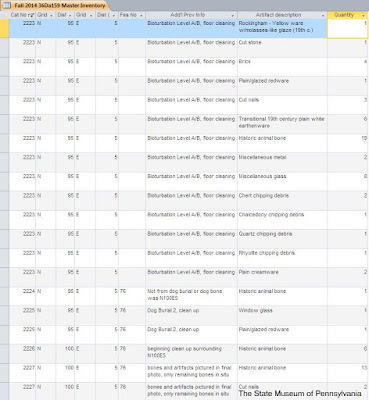 The bag inventory is then used to assign unique catalog numbers to all proveniences represented in the artifact collection. 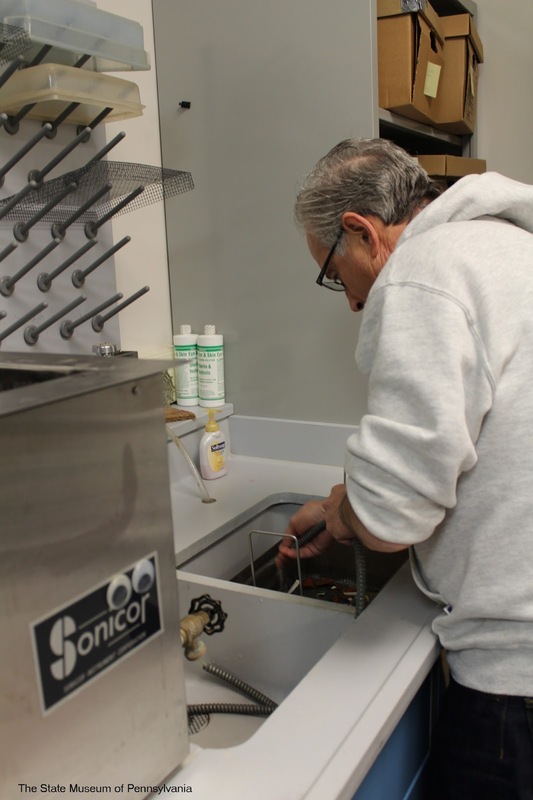 Cleaned artifacts that are at least a square inch in diameter and are material types that can be safely treated with a reversible acryloid basecoat (e.g. - most historic and prehistoric ceramics; prehistoric stone tools; historic glass and brick) are labeled with their site number— a trinomial abbreviation developed by the Smithsonian which includes the state, county, and site information—and their designated catalog number in archival ink. Labels are then sealed with a clear topcoat to ensure longevity for long-term curation. 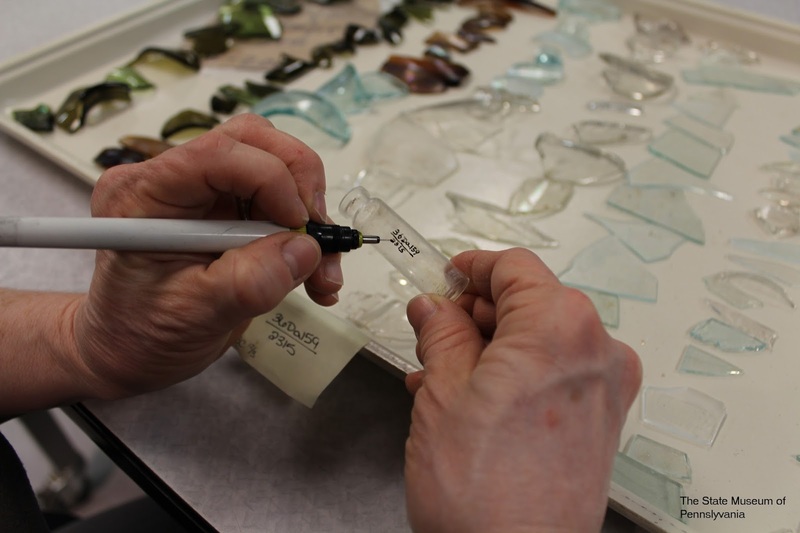 It may seem excessive to label the copious amounts of bottle glass, brick and other materials that are recovered from Fort Hunter every year, but it is well worth the time investment. The most valuable aspect of each artifact recovered is where it was located in relation to other artifacts and features on the site. This is often referred to as an artifact’s context, and is what ultimately allows archaeologist to interpret past human behaviors. Labeling artifacts with this coding system allows us to quickly know where they were recovered from, and is a safe guard against losing this information when objects are frequently pulled out of storage for further analysis. 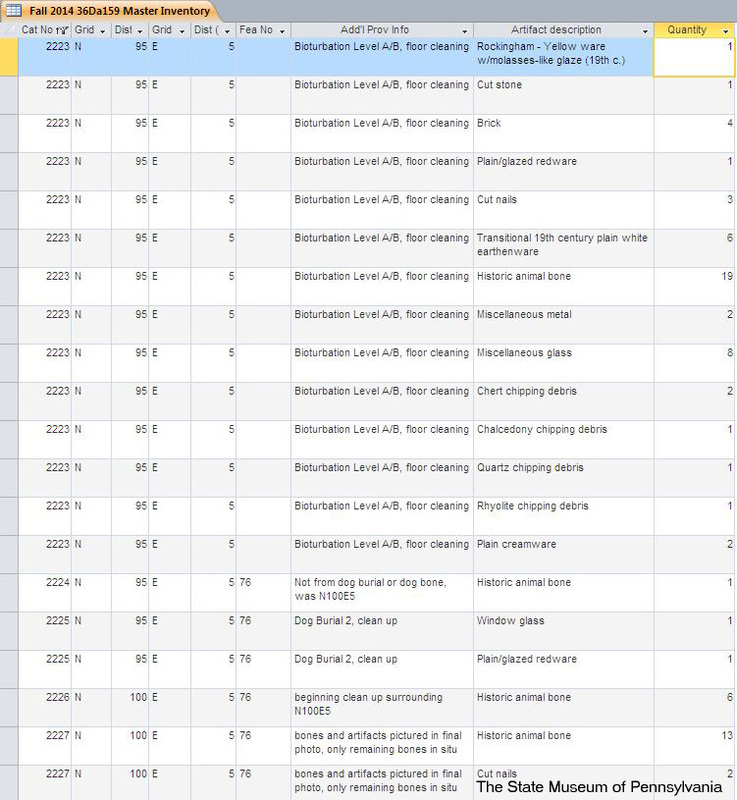 The final steps in the artifact curation process are to add a description of each artifact or group of like artifacts into the digital inventory by catalog number, and bag and box them carefully to insure their preservation for long-term curation. This is all done in a systematic manner so that any given artifact can be easily accessed and utilized by future researchers. Maintaining a complete inventory and well organized collection for Fort Hunter year to year is particularly important because we continue to learn new information with each field season. Our interpretations continue to expand and refine as we delve further into the historic record through archival research and as our field investigations contribute further insights into material culture practices that both validate the existing historic record and broaden its scope of perspective. The State Museum’s Section of Archaeology is the principal repository for archaeological collections in Pennsylvania and maintains over 7 million artifacts and associated documents. Fort Hunter field documentation and digital photographs are also archived in the Section’s county files and on a secure server with backup contact sheets and logs. 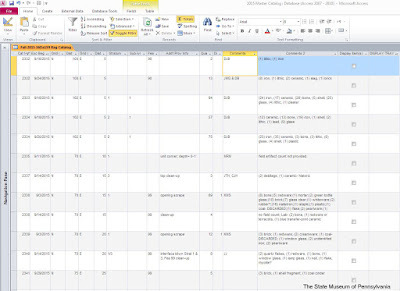 These documents are constantly referenced to draft reports and articles; to create maps; to relay information in public and professional forums through presentations, exhibits, blog postings and other media outlets; and to plan further investigations. Each piece, from the artifacts recovered to field records and photographic documentation, fits together to reconstruct the story of Fort Hunter’s past. When the field work is done, we rely on sound conservation practices and accurate digital records to preserve access to Pennsylvania’s rich archaeological record for generations to come. Our next blog will delve deeper into an important aspect of reconstructing and preserving archaeological contexts at Fort Hunter through digital mapping. Special thanks to all the 2015 volunteers and interns that have greatly contributed to Archaeology Month programs this fall and post-excavation processing of the Fort Hunter collection. Thank you for preserving our past for our future—Andi B.; Jerry B.; Mary C.; Toni and Andy D.; Phil F.; Erin, Kaela and Keara F.; John G.; Keenan H.; Jonathan K.; Ruth K.; Linda L.; Brad M.; Seth M.; Fred M.; Paul R.; Wendy S.; Chriss S.; Wes S.; Clydene, Stephanie and Steve S.; Andy S.; Merikay W.
If you are interested in learning more about archaeology methods and Pennsylvania Prehistory check out First Pennsylvanians: The Archaeology of Native Americans in Pennsylvania available for purchase online and at The State Museum gift shop.